Barcode label maker – standard edition helps you to generate high-resolution barcode labels, tags, stickers and coupons in different shapes and sizes according to your need. Barcode label maker program is capable to create multiple barcode labels simultaneously using random, sequential and constant value series generating features. Generates linear and 2D barcode labels, stickers and tags. Designs colorful barcode images using inbuilt color settings. Creates barcode labels in different shapes such as rectangle, ellipse and rounded rectangle shapes. Prints created barcode images by inbuilt printing settings. Allows user to copy Barcode Label and paste at specified application including MS-Word, MS-Paint and MS-Excel. 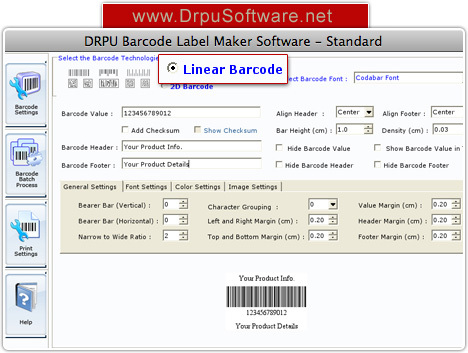 Barcode Label Maker – Mac software designs barcode labels for business products and inventory. Barcode software provides complete solution to design linear and 2D barcode labels, tags, coupons, rolls and stickers. Barcode label maker program generates bulk barcode images and provide option to save these barcode images in JPEG, TIFF, Bitmap, PNG, WMF, EMF, EXIF and GIF file format as per your requirement. Generates barcode images in different shapes and sizes. Provides random, sequential and constant value series generating features to create bulk numbers of barcode images. Designs linear as well as 2D barcode labels and images. Offers data set series option to create multiple copies of labels with different barcode and text value. 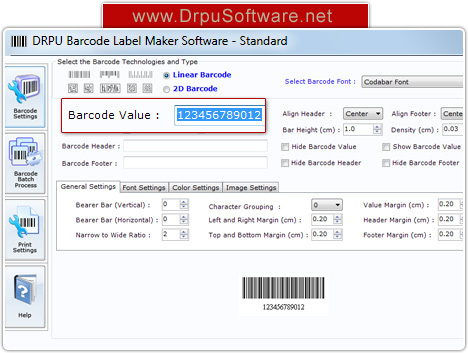 Creates Barcode Labels with option to specify Barcode Value, Barcode Header and Barcode Footer. Provide option to set Bar Height and Density of barcodes with Margin details (such as Value, Header and Footer).